Taylor Myers thinks he has a green solution for America, one that advocates say can lower the average household’s carbon footprint of some 50 tons per year by three to four tons. 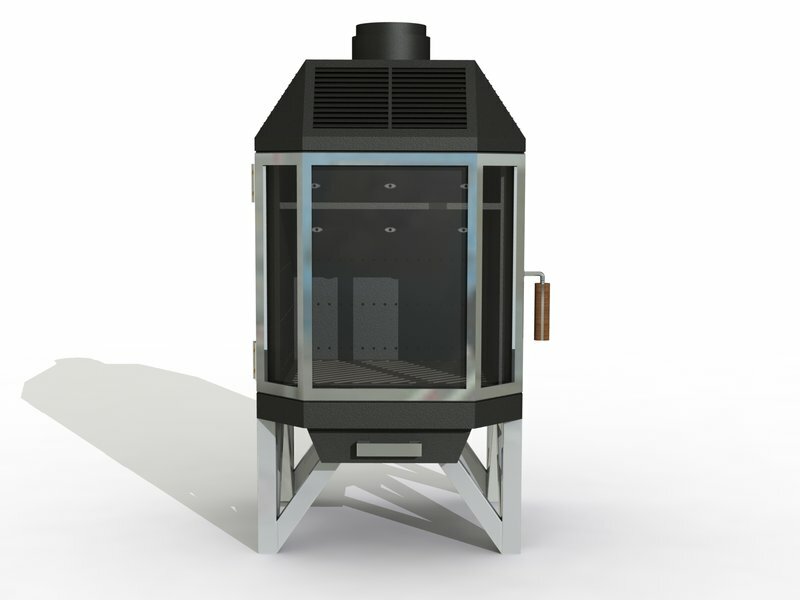 A wood stove, lowering a person’s carbon footprint? The idea is befuddling. A wood stove provides heat by literally setting carbon—in the form of dead trees—on fire. “For the most part, everyone is still setting stuff on fire to get energy,” says Myers. The PhD candidate in fire prevention at the University of Maryland explains that burning natural gas to run a heater—or using an electric heater, which ultimately gets its juice from a probably-coal-fired power plant—can emit far more carbon dioxide than a typical wood stove. The problem with most stoves is not the carbon dioxide, but the smoke. “Black carbon,” or soot, from wood stoves and forest fires, is now thought to be the second most significant man-made agent in climate change. It’s also a big health risk, especially in developing nations where wood-burning stoves are the primary way people cook food. The World Health Organization estimates that 4 million people die prematurely each year from diseases related to smoke inhalation. But it’s not true that where there’s fire, there must be smoke. Smoke, says Myers, is a byproduct of incomplete combustion. Burn wood more thoroughly and there will be less smoke and more heat. That is what Myers says the Mulciber stove, an award-winning wood stove he developed with a team at the University of Maryland, does very, very well. Mulciber uses a computer-controlled fan to adjust the airflow inside the stove, similar to how a carburetor in an engine adjusts the fuel-air mixture for optimal burning. “We can control how much air goes to different places,” says Myers. “You have precise control.” With that precise control comes a phenomenally low level of smoke. The U.S. Environmental Protection Agency just released rules limiting particulate emissions of wood stoves sold after January 1, 2016 to 4.5 grams per hour, or three to ten times less than the 15 to 40 grams per hour that an older stove emits. Mulciber, Myers says, emits just 0.2 grams per hour—less than half of the smoke produced by smoking a cigarette. So how did a fire protection engineer get into building a box that makes fire? Myers, together with Ryan Fisher, a fellow grad student, and a team of undergrads, had never built a wood stove before, but their faculty advisor, Stanislav Stoliarov, is an expert in materials flammability. The Mulciber won the Low Emissions Prize in Alliance for Green Heat’s Wood Stove Decathlon in 2014, then it took home the Grand Prize in 2015. Myers and Fisher started a company, MF Fire, working to commercialize the prototype, and if all goes well, the stove will hit the market this summer. Beta units are being tested right now, Myers says. So how green is it to burn wood? Wood-stove advocates point to the amount of wasted wood each year as part of a stove’s green cred. Unlike natural gas, which has to be extracted from the ground using invasive techniques, or coal, which likewise leaves scars across a landscape, wood comes from trees, which regrow and are often harvested locally. Most of the U.S. firewood supply, for now, comes from trees trimmed or felled for some other purpose, Ackerly says. “It’s not industrial clear-cutting. Here, there’s a glut of firewood, and [the extra] gets dumped into landfill, or it gets chipped up…for mulch or animal bedding.” If it’s going to waste, advocates say, why not burn it? The actual carbon emissions from burning wood are complicated to quantify. Once a tree is cut down, it begins to decay, and the carbon stored within it is released back into the air, just as it would be if it were burned to heat a home. So wood-stove advocates argue that wood-burning stoves are essentially carbon neutral compared to if the wood had been cut down and used as mulch or just thrown away. But critics say that is not the whole story. A tree made into a house or furniture, of course, is a way to sequester carbon away rather than letting it rejoin the carbon cycle. A tree that is landfilled may not decompose at all—landfills are notorious for not breaking anything down. And a tree that was never cut down will continue to absorb carbon from the atmosphere, maybe for decades. So it’s not as simple as that. And if people continue to use older stoves, smoke pollution will continue to be a problem. But as long as wood in this country is being thrown away instead of burned, Ackerly thinks there’s a greener way to heat America’s homes. “We want policymakers to see that a $2,000 appliance can reduce your carbon footprint hugely,” he says.